MEXICO BOUTIQUE HOTELS was honored with the Mexican Company of the Year 2013 Award for its dedication to quality and innovation in Mexico. Panama City, June 2013. 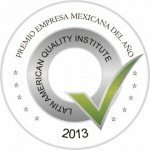 MEXICO BOUTIQUE HOTELS received the most important award of the continent, the Mexican Company of the Year Award 2013, during the sixth edition of the Mexico Quality Summit organized by the Latin American Quality Institute (LAQI) on June 12th in Mexico City. During the ceremony organized by LAQI, MEXICO BOUTIQUE HOTELS was recognized for its development and business growth with relation to its tireless work towards securing a profitable and positive future within Mexican society. “The Mexican Company of the Year Award 2013 selects those great companies that, through their values and innovation, drive new business strategies for its own growth as well as commitment to social responsibility and sustainable development. For this reason, MEXICO BOUTIQUE HOTELS provides an example to follow within Latin American society as representative of a business culture in Mexico that is aligned with the LAQI 40 + 10 Acciones” says Dr. Daniel Maximilian Da Costa, Founder & CEO of LAQI. MEXICO BOUTIQUE HOTELS was recognized as a company that demonstrates the core values of business excellence, service excellence, corporate responsibility, sustainability and success in their respective industries. This is the annual convention that brings together prestigious entrepreneurs in various categories. Participating companies and members of the organization share training sessions about relevant business topics, allowing them to acquire knowledge for better management issues. In addition, entrepreneurs share their experiences, opinions and projects through various forms such as panels and workshops. This award recognizes entrepreneurs and companies from various sectors that play an important role in society through initiatives in business, and that also serve as a model for other companies or institutions. The award recognizes leadership and vision that makes a lasting impression as well as best practices and strategies that serve as inspiration for others.